The time is quickly approaching for the season to begin and we have just what you need to host amazing parties all season long, right through all those Bowl games! The Hello My Sweet essential Football Party Set is the perfect accessory for your football parties, and is reusable again and again! 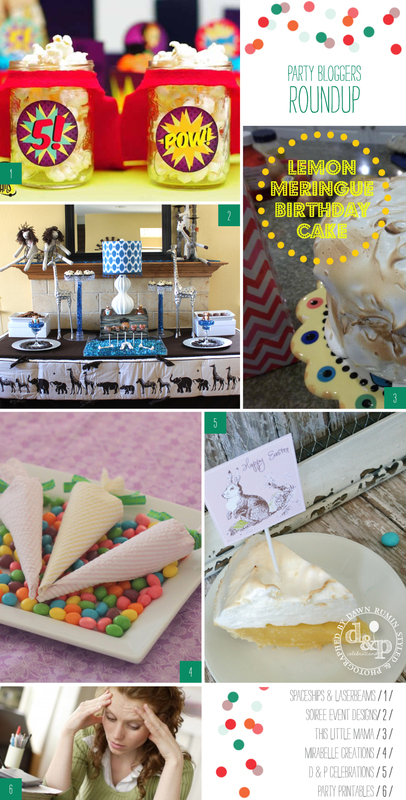 Creative Birthday Party Ideas from some of the best party bloggers out there! Spaceships & Laserbeams shows 30 awesome DINSOSAUR PARTY ideas for prehistoric fun! Soiree-Event Design has 6 STEPS TO PLANNING AN EVENT in this handy guide. This Little Mama is making a DIY MASON JAR CHANDELIER with basic materials from the hardware store. Sweet Song Bird shows us a fun twist on party decor with a DIY NAUTICAL STRING ART project. Mirabelle Creations has a creative approach to APARTMENT DECORATING IDEAS using recycled party props. D&P Celebrations has LITTLE FRIENDS, SQUINKIES INSPIRED PARTY printables. Magnolia Creative celebrates the Louisiana Sweet Potato Festival with her favorite SWEET POTATO RECIPE. Creative Juice has a cute and fun way to celebrate potty training success, a POTTY TRAINING PARTY. Cupcake Wishes & Birthday Dreams shows us adorable party favors on a faux sweets table using SOAPS THAT LOOK LIKE DESSERTS. BellaGrey Designs shares her son’s vintage BASEBALL PARTY. My Paper Pinwheel threw a mini EASTER EGG HUNT for Baby Lifestyles Magazine. Three Little Monkeys Studio makes us drool over this easy S’MORES CUPCAKES RECIPE. Party Tips, Decorations and Ideas perfect for your kids! Spaceships & Laserbeams has done it again with a uper colorful, clever and fun SUPERHERO PARTY, proving that capes really are the accessory to have right now, on your popcorn and cupcakes! Soiree-Event Design has a NOAH’S ARK BABY SHOWER and shows you her top 3 ways to get a popular party look for less! This Little Mama has the perfect birthday cake for a pie lover, LEMON MERINGUE CAKE. Mirabelle Creations shows you how to make NO SEW FABRIC CARROTS FOR EASTER. D&P Celebrations has a loely set of DIY PRINTABLE EASTER BUNNY DECORATIONS. Magnolia Creative has designed an EASTER CENTERPIECE AND FLAG PRINTABLES for you to decorate your dinner table with. Creative Juice wants to add some DIY EASY WINDOW DECORATIONS to your home using tissue paper! Frog Prince Paperie has a free printable GET WELL SOON CARD or you to download and use. Cupcake Wishes & Birthday Dreams has a FREE CHOCOLATE BUNNY PRINTABLE with gingham and bunny tails. Bloom Designs show us their APPLE OF THEIR EYE PARTY ON THE TODAY SHOW super pink and green and fun! BellaGrey Designs has a BAPTISM PARTY COLLECTION that is also perfect for easter as well. My Paper Pinwheel shows you how to make an adorable baby CHICK PUSH UP POP for the kids Easter baskets. Party Printables tells us HOW TO HANDLE IT IF PEOPLE DON’T RSVP to our party invitations. Three Little Monkeys Studio shows us some PARTY DESIGN BASICS DIY CUSTOM PARTY UTENSILS. We just LOVE looking at all of the creative and colorful Easter Egg Decorating Ideas across the web this time of year. They inspire us to be creative and have a fun family moment all at the same time. Our kids really enjoy doing crafty things just as much as we do. 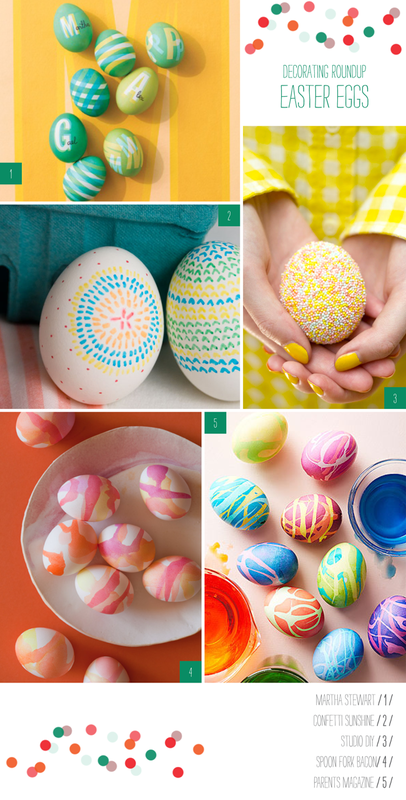 The following are a few of our favorite Easter Egg Decorating Ideas this year. Spring is officially here and we have gathered a few of our fellow bloggers up to give you Spring Party Planning, Decorations and Ideas perfect for the season! Spaceships & Laserbeams is prepared for the warm weather and everything that comes with it, including bugs, check out this bug birthday party. 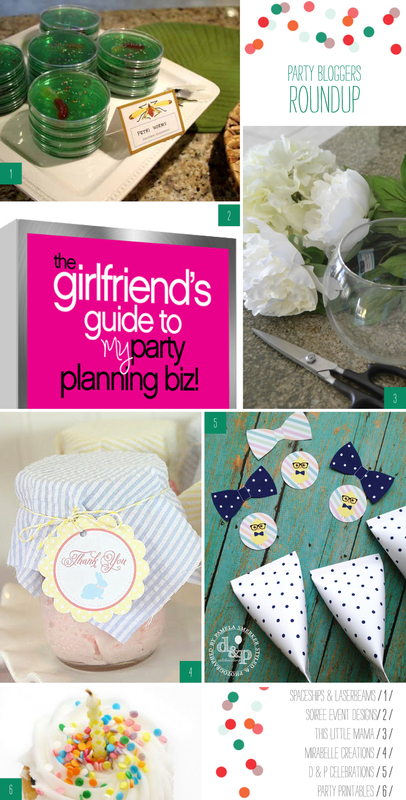 Soiree-Event Design has a girlfriends guide to party planning so you can knock the socks off your guests this year, even if you are new to the party planning scene. This Little Mama wants to show you how to get $150 worth of flower arranging as seen on One King’s Lane for only $20 with this DIY faux flower arrangement. Mirabelle Creations has gone super southern this spring with a printable Seersucker & Bow Ties Easter Collection. D&P Celebrations has a nifty sour cream container tutorial perfect for Easter or spring party favors. Magnolia Creative has done the hard part for you and created a list of free printables and Easter ideas from Pinterest. Creative Juice wants to add some whimsy to your spring with a recipe for rainbow french macarons. 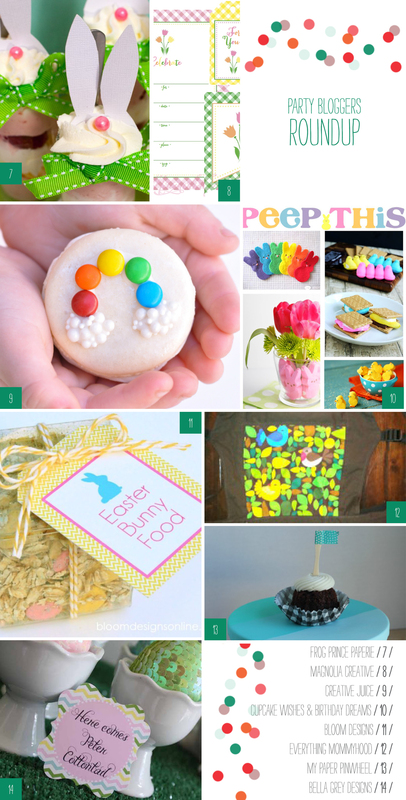 Cupcake Wishes & Birthday Dreams has gone plum Peep-ing crazy with this roundup of marshmallow peeps Easter ideas. Bloom Designs has whipped up a batch of super cute Easter bunny food for your child’s classmates or to spread out for the Easter bunny. BellaGrey Designs wants to your party to be chic with chevron designs in this Easter chevron party collection. Everything Mommyhood shows you how to tote your tot with a Boba carrier in new spring styles. My Paper Pinwheel continues a trend with a fashionable ombre cake stand you can paint yourself. Party Printables wants to share their top 10 children party games for maximum fun. Frog Prince Paperie is cooking up delicious Easter desserts including mini lemon raspberry trifles. For some men, the art of shaving can be as simple of an act as removing hair from one’s face. For other’s it a more personal ritual. I know that when I started shaving, I hurried through it just to get the act over with. As I’ve gotten older, I’ve come to appreciate taking your time and really enjoying the experience. The other thing I’ve found is that the tools you use to shave with can definitely impact that experience. Even now, while shaving with fairly inexpensive razors, I don’t feel like I’m treating myself and my face to the best possible experience. Again, this goes back to the feeling that shaving is a chore that just has to get done, no muss no fuss. But that’s not necessarily how I want that experience to be. It’s akin to purchasing a very functional piece of furniture from IKEA. Yeah, IKEA products are nice, relatively cheap and you feel comfortable with it. But imagine if you treat yourself to something from a store like Restoration Hardware. That is how I feel about the shaving kits from The Art of Shaving. Whether you are purchasing something for yourself or gifting one of their many kits, you can be assured that the experience you are giving will certainly transcend the ordinary. Check out all the amazing products at The Art of Shaving, as well as their 4 Elements of a Perfect Shave, and make the ritual of shaving enjoyable again and something to look forward to. Go ahead and treat yourself (or your man)…your/his face will thank you. Click here to take advantage of this great offer from The Art of Shaving! Click here to take advantage of this great offer from The Art of Shaving! Click here to take advantage of this offer from The Art of Shaving! 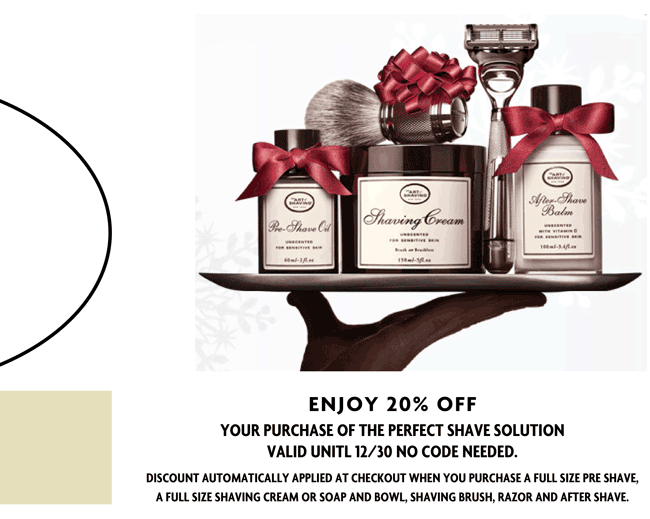 Enjoy 20% off your purchase of The Perfect Shave Solution. Valid unitl 12/30. No code needed. Discount automatically applied at checkout when you purchase a full size Pre Shave, a full size Shaving Cream or soap and bowl, Shaving Brush, Razor and After Shave. Free Ground Shipping and 10% off ProGlide Power Shave Set, Through 12/30/12. 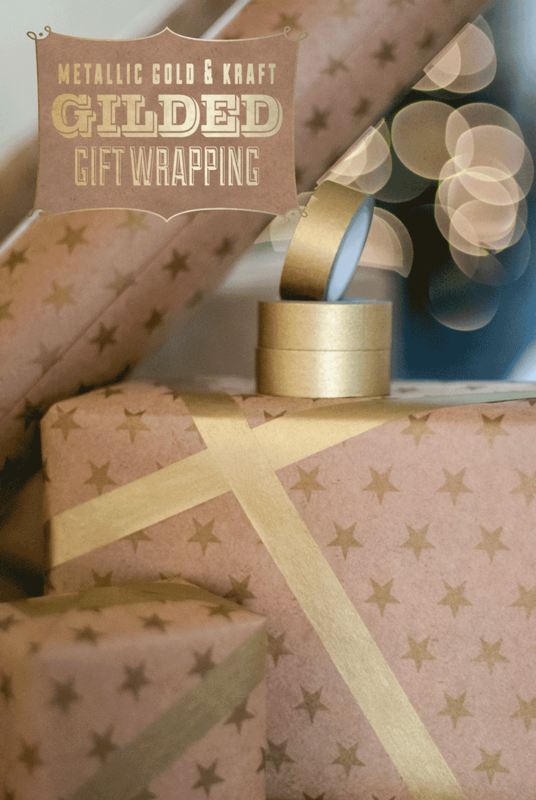 We wanted to share our Christmas gift wrap this year for two reasons. 1. It is a bit non-traditional, and we love that about it. 2. It is very inexpensive, and we love that you can’t tell. We found an abundance of kraft paper at our local Dollar Tree a few weeks back, many different patterns and even just plain ‘ole kraft, but this star pattern caught my eye so I brought it home. I have never been a fan of the pre-made stick-on bows, which are inexpensive, but they also look like it. Keeping my eyes peeled for something unique I spotted a sale on Washi Tape from Pick Your Plum and scooped up several rolls of the gold metallic. Altogether I’ve spent $10 on wrapping supplies, 3 rolls of the tape and 2 rolls of the paper. Not too shabby! What are you wrapping with this year? Last month we made a pilgrimage to Hobby Lobby. The last time we visited was way back in March, so we were overdue for certain. At that time they were bringing out spring and summer finds and everything was bright and cheerful and screaming “warm weather is coming.” Well now the warm weather is here. Hot weather even, and we are looking forward to fall. Apparently Hobby Lobby is looking forward to Christmas though, because that is what we were confronted with when we walked in. Here is a little preview of what caught our eye! Shiny Glittering Trees - These came in lots of varying heights and were major bling! I really liked the modern sleek shape AND vintage glittered lines combined together. Silk Wrapped Ornaments - These scream NOSTALGIA for me personally, as I remember helping my grandmother decorate for Christmas with these each and every year. I haven’t seen anything like these in a really long time and I was happy to! 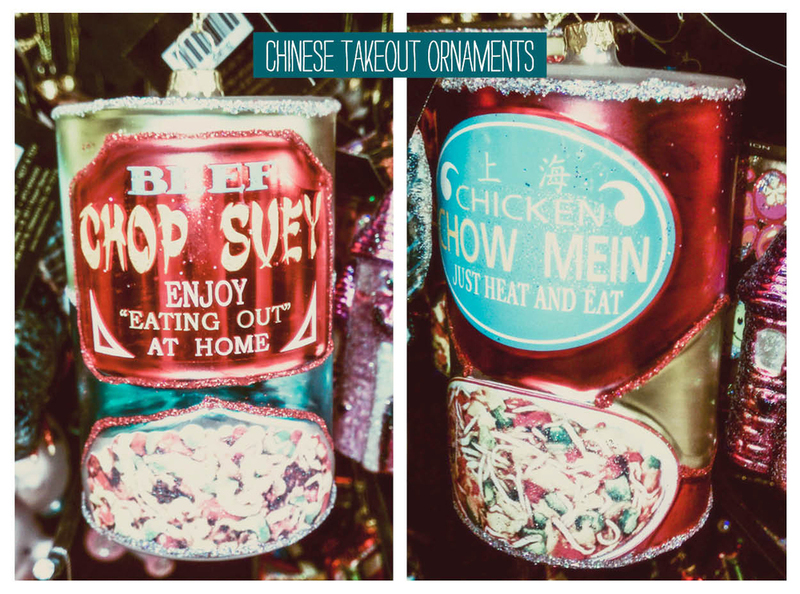 Chinese Take-Out Ornaments - Ahhh! These were sooooooooo cute and fun. How would you feel about a Food Themed Christmas Tree? Sometimes shopping at thrift stores can yield awesome results. Case in point, a few weeks ago I scored a purple cashmere J.Crew sweater, just my size and oh so soft, from our local Goodwill. I love it and it was only $3.50. Having purchased them at full price many moons ago ($120), I felt like I had won the lottery. Well today marked a new high in thrift finds. Only this item isn’t even used, it is brand spanking new. 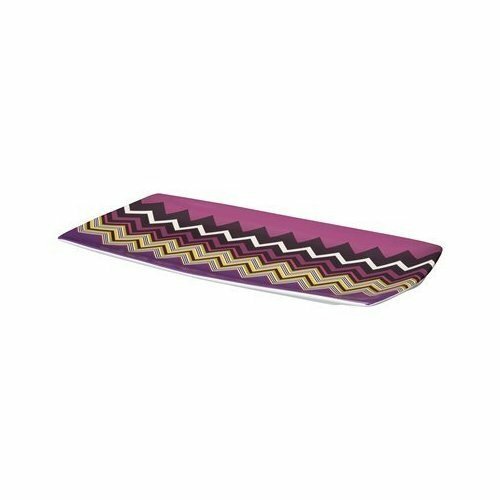 Considering the craze that went down over the Missoni for Target line last year (which we did not participate in) this find feels a lot like winning the lottery too. Today at Goodwill of all places, Jason found this awesome platter. According to Amazon.com it retails for $44.99 + shipping. Guess what Jason paid? $5.26 + no shipping. AWESOME! I think this is the start of a fabulous new themed Dessert Table! While we revel in our deal finding glory over here, let us know, what’s the best find you’ve found recently?